F1 2015 brings a much-needed upgrade to the franchise making this the best F1 game so far, but will have to keep working hard to catch up to itself. Confusing statement? Here’s our review. For the past few years, the F1 games by Codemasters have done what many sports franchises do – release an annual update with the latest roster, some rules changes, a few tweaks here and there, and perhaps a new gamemode which doesn’t drastically change the core gameplay experience. We’re not complaining by the way – the sport itself, be it football, baseball or F1 racing, just doesn’t change that much every year. Then, every few years, there’s a leap forward again. Fifa did it a few years ago by introducing a new engine, as did Pro Evolution Soccer. Now it’s Codemasters’ turn, as they release F1 2015 featuring a brand new engine and graphical overhaul to fit with the new generation of consoles and PCs. It was needed as well, since the previous entries had all been running on the framework of a game still designed for the X360 and PS3 – hardware that’s now almost 10 years old. In the latest incarnation, you’ll see plenty of updated weather and lighting effects, which work especially well in rainy and nighttime conditions. Although the PC version always supported higher resolutions, things like improved reflections and shadows make a difference this time – as does an added level of detail. 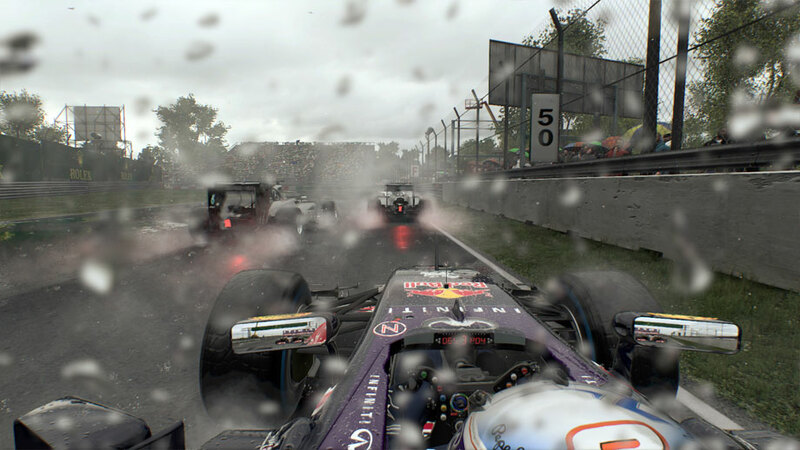 F1 2015’s only problem is perhaps that Project Cars came out recently, and has set a new standard for racing sims in terms of graphical fidelity. Luckily the update in the graphics department isn’t the only thing that’s new. 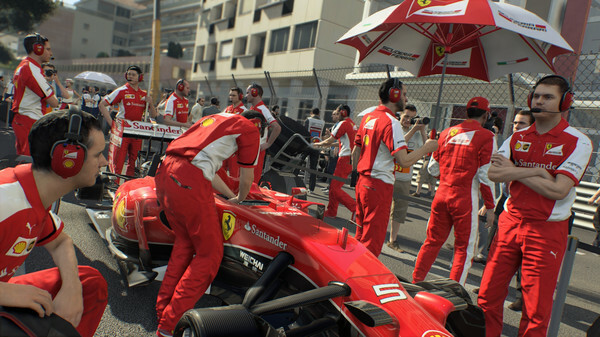 The steering and handling in F1 2015 has also been vastly improved, which makes the actual driving experience – the core of the game – a joy to play. The game might be not be sim-like enough for die hard formula 1 fans, but that’s to be expected for a multiplatform title these days. It seems like the aforementioned updates were given the majority of the focus and attention by the developers last year, because several of the game modes that were introduced in the past couple of years (like a career/story mode) are now nowhere to be seen. This creates for an experience that has a rock solid core, but feels a little lacking in the ‘extras’ department. We’re hoping Codemasters will build on their strong foundation next year, but we’re happy with the steps taken in this year’s version. In closing, we’d like to point out that we playtested this game post-release. We’re aware of the technical issues that plagued the game at launch, but were lucky in that we got to enjoy the fixes that the subsequent patches provide. As such, these technical issues didn’t affect our score.